While we’re not sure exactly how this came to be a private island, Ko Talu today is known for its efforts at reef reclamation after destructive fishing practices decimated the reef. Browse places to stay in Bang Saphan Yai on Agoda.com. Free cancellation. Fishing was banned and (depending on who you talk to, a bunch of fishermen were kicked off the island) work began to repair the reef. Today it has received considerable media acclaim, and while there are plenty of fish, the reef remains in a badly degraded state and while most of the fishermen have gone, the dozens of boats loaded up with daytrippers do their own fair share of damage, throwing anchors all over the shop and depositing dozens and dozens of snorkellers in quite congested settings. 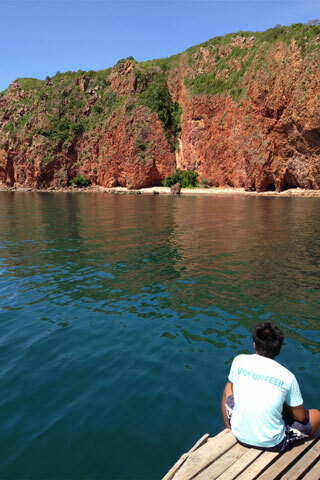 There are three main ways to visit Ko Talu. You can stay at the resort, you can do a snorkelling daytrip with the resort which will allow you to snorkel in two spots, then spend a few hours on the resort’s lovely main beach and enjoy a pretty good buffet lunch, or you can do a snorkelling daytrip with Suchart boat tours, which will allow you to snorkel at the same two spots but you won’t get to set foot on the island proper. Each of these options has advantages and disadvantages. Obviously staying at the resort is the most expensive way to do it -- the resort snorkelling trip costs 1,300 baht per person, but you’re taken in a reasonably comfortable speedboat. Suchart’s trips go in older (and slower) converted fishing boats that can be extremely crammed with people, and cost 350 baht. The two snorkelling spots are the same, so on the weekend and over public holidays it can be very crowded, to the point we’d say it’s not worth going.